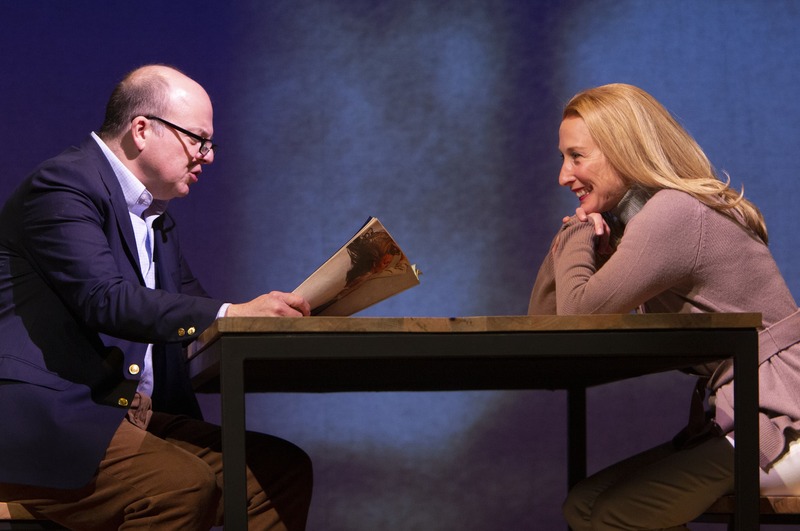 Journalist, novelist, and playwright Calvin Trillin focuses on themes of loss, language, and love in his play About Alice. Alice was Trillin’s wife, his muse, and often a character in his articles and stories. She was diagnosed with lung cancer at the age of 38 and beat the odds, surviving for 25 years. After she died in 2001 from complications of that cancer, Trillin received letters of condolence from people he (and Alice) didn’t know, who felt like they knew Alice from the articles and books Trillin had written. He wrote an autobiography called About Alice in 2006–which inspired this play—to rectify the image people had of his wife, the image he had created through his words. About Alice just has two characters, Alice (Carrie Paff) and Calvin (Jeffrey Bean). Trillin begins his show shortly after Alice’s death, as his character is reading out loud the condolence letters he’s received. He flashes back and forward in time after that, throughout Calvin and Alice’s relationship. Jeffrey Bean is like that clever uncle you wish you had. He’s kind, wry, and comes off as very sympathetic. His banter with Carrie Paff is very natural, and his comedic timing is perfect—as in a joke about how Calvin had his two daughters, then aged five and eight, sign a non-disclosure agreement so they could never write about him. Bean paints a realistic portrait of a grief-stricken man who really loved his wife. And the viewer can feel why he fell in love with Alice. It was difficult to stop watching Paff as she moved around the sparse stage. She commanded it even during Bean’s monologues, when she was doing something like putting on a blazer in the closet toward the side of the stage. For a story that spans decades, the stage is simple. There were only a table, several chairs, a closet full of clothes for the actors to change into, and a door to nowhere. The table doubles as Alice’s hospital bed later in the show. This spareness, designed by Riccardo Hernandez, keeps the focus on the actors and the story they’re telling. Bean and Paff occasionally leave the stage to walk through the audience, which added more dimension to the space. Paff changes costumes frequently to suit the year Trillin is reflecting on. Calvin, lost in memory, doesn’t have any very noticeable costume changes. The costumes, designed by David C. Woolard, were of their time and suited Alice, but she had perhaps too many costume changes, especially contrasted to Calvin. Alice’s hair length would also change based on the time in her life, and the wigs were very poor, with wig netting that could be seen on Alice’s forehead from the audience. Although Alice’s wigs might pull the audience a bit out of the story, the lighting, by Russell H. Champa, sets the mood and highlights Calvin’s emotions. When Alice first appears on stage only her silhouette can be seen against a screen. She has died, but she’s always in Trillin’s mind. In another moment, when Calvin first meets his future wife, the stage is overlaid with dazzling lights that temporarily turn it into a swanky New York City magazine party. The show, directed by Leonard Foglia, is a relatively tight 75 minutes, but it does meander in the middle when Calvin reflects on his married life. Time is very fluid, which does seem to hold true to memory. Yet because it is so fluid, Foglia didn’t necessarily need to mark each passage of time with a wig and costume change, which slow down the action. The audience didn’t need to see, for example, what Alice wore on one of her numerous summer vacations to Nova Scotia with her children and husband. The costume changes could have been reserved for important moments like Calvin meeting Alice, Calvin asking Alice out on a first date, her diagnosis, and the end of her life. Trillin is trying to correct the “sitcom” people viewed Alice as, but I don’t think he fully succeeds. Sure, he shows some of her flaws: She’s vain, overzealous, and constantly optimistic. To a viewer who has lost someone to illness or cancer, as I have, Alice’s eternal optimism is annoying. Maybe she was really like that, but it comes off as a bit patronizing, rather than realistic. Trillin’s character does not share her sunny view, but he also doesn’t dig into it at all. Although the viewer might empathize with Trillin and his loss, in the end the death of Alice is not very impactful. I found myself sad, but thinking of the person I had lost instead.